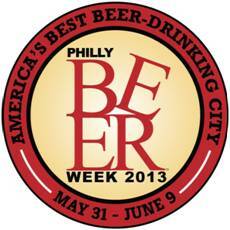 I am so woefully unprepared for Philly Beer Week...and it starts in less than 48 hours! The fun all starts on Friday at 9:30 AM out in Fox Chase at the Hop Angel, where the Hammer o' Glory begins its amazing route to Opening Tap, all the way down at Independence Mall, where Mayor Michael Nutter will tap the opening keg (no word on whether he'll be charged a 15% by the drink tax). The map below (from Danya Henninger's blog at Zagat), shows all the spots where the HOG will change hands: it travels by roller skaters, cargo bike, kinetic sculpture, through the Free Library of Philadelphia by book cart, horse carriage, wheelbarrow, and whatever insane and personally hazardous conveyance William Reed comes up with at Standard Tap this year. It's a crazy way to start the week, and you're free to join in at any point. Once you've followed the HOG to Opening Tap and hobnobbed with the cream of Philly's beer scene (like Mat Falco, of PhillyBeerScene),where do you go next? Well...damn near anywhere in Philly and the immediate surroundings. Seriously, there is stuff going on almost around the clock; check the website or download the free (and excellent, adaptive, useful, quick, constantly updated) app for iPhone or Android. Use the app to do things my favorite way: no planning, just head into town, get off the train/bus/trolley/bike/designatedly-driven car/truck/motorcycle, fire up the app, and find out what's going on nearby. I guarantee, you cannot lose. This is not like the other "beer weeks" you'll see elsewhere; this is immense and overflowing, it takes over almost the entire city, and there are not a few events every day...there are an overwhelming number of events every day. Believe me when I say that Philly Beer Week is too big for any one person to encompass, experience, or comprehend. Kinda like American craft beer, of which it is a great representation: it's diverse, it's fun, it means very different things to different people, and it goes really well with food. World Whisky Day tasting at Teresa's in Wayne: join me! Grueling research in the malt kilns of Bowmore. No Scottish boat rides are included in this tasting. Sorry. The gang at Teresa's Next Door contacted me a while ago with a great idea: this new World Whisky Day thing...how about you come out to Wayne and we do a whisky tasting? I checked my calendar, May 18 was open, so I said hell yeah, and we started talking whiskies. Here's what's going to go down. We're going to do the tasting on Saturday afternoon, May 18, from 12:30 to 3:00, so there's plenty of time left in the day to do other things (like get on the train and head into Philly, or just stay right where you are and enjoy the great beers at Teresa's). Irish: Redbreast, the mother of Jameson. Scotch Blend: Compass Box Great King Street, because good Scotch doesn't have to be a single malt. Sherried Single Malt: Glenfarclas 105, a big ballsy malt. Peated Single Malt: Lagavulin 16, from the peaty shore of Islay; smoke it if you got it. Rye: Templeton Rye, small bottler, big flavor. Bourbon, before and after: Buffalo Trace and Buffalo Trace White Dog, for an inside look at what the barrel does to whiskey. All that plus Teresa's seriously good eats to go with it (snacks, but good and carefully paired), plus my amazingly interesting insights on just what the hell it is you're drinking...well, it's quite a deal at $45 (and you have to call ahead 610-293-9909, or email before the event to get registered). Hope you can join us on Wold Whisky Day, May 18th!